I competed at the Minnesota State Meet as both a freshman and sophomore. 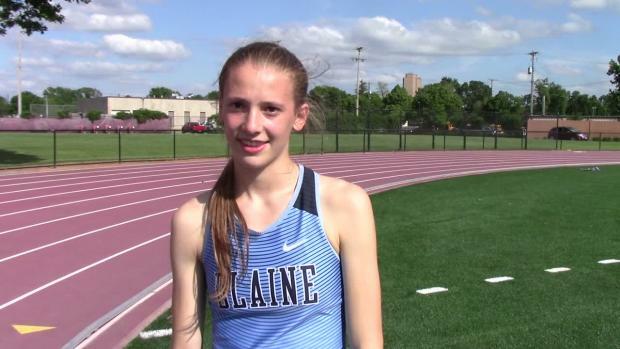 My freshman year I finished 7th in the high jump and my sophomore year I was the high jump champion and ran the anchor of Blaine's 4x400 team. I first got involved in track in 4th grade; my mom coached me and my sister through a local youth program. Having been a Minnesota State high jump champion herself when in high school, she both taught and inspired me to jump. The same year I began track I also started playing volleyball and basketball. Through middle school and freshman year I also played soccer in the summer. Ever since I began, I have devoted countless hours to each of these pursuits. In track I have been a varsity athlete since freshman year and I have competed as a varsity athlete in volleyball and basketball since sophomore year. I really have two favorite competitions I have been in. 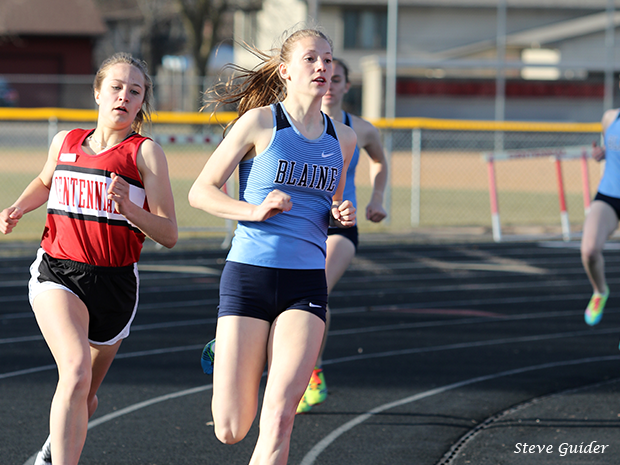 The first was the past season's conference meet. Even though I had to run from the high jump without finishing my attempts to make my heat of the 800 M prelims, I still managed to be conference champion in both high jump and the 800 M the next day. My 4x800 and 4x400 relays were also all conference. The best part was that we were conference champions as a team, and though we didn't get our victory lap because of a lightning storm, it was truly an electric feeling. My other favorite competition was this past year's State Meet. 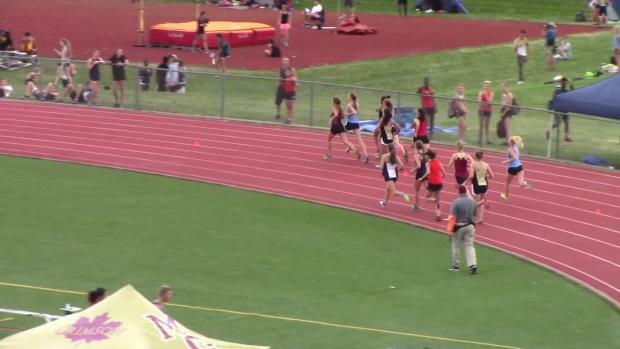 Even though the stakes were higher, it was the least stressful meet of the year for me, especially having just to worry about high jumping and running the 4x400, which, as a distance runner, is really more exhilarating than exhausting. The whole day my jumps felt effortless, and I loved being able to spend time between jumps with the other girls, many of whom I have jumped with at other elite meets and shared blankets, umbrellas, and rollers with. Jumping a new PR and winning the competition was immensely rewarding after all the work I put in during the season and I was incredibly thankful to be be blessed with such an opportunity and result. It's rare for an athlete to be as successful as you competing in both the high jump and middle-distance events. How did you end up doing both? Throughout my younger years of running track, I competed in almost all of the events I could. High jump has always been my favorite event, initially because of my mom's legacy, and then because of how natural it was to me. In my later years of middle school and beginning high school I settled on running mid-distance because I loved the work it took to train for my events and the sheer endurance it took to run them. Although I feel like I could succeed in most any running event in track that I applied myself to, I have always loved the 800 M because it forces you to have the right mindset going in and to constantly overcome your mental and physical limits. Even though it can seem impossible to maintain the pace you start out, you have to fight through and push yourself even harder as you go, and from somewhere inside, find the determination to grind out the last stretch. 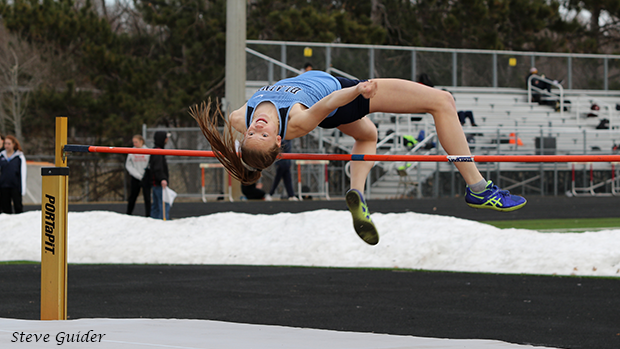 Tell me about what it was like to sweep the high jump at the Hamline Elite Meet and the State Meet last year. It was extremely rewarding to win the high jump at both the Hamline Elite Meet and the State Meet last year. The Hamline meet gave me great experience in competing with other elite jumpers and allowed me to connect and bond with the others, which was something that helped put me at ease in the State competition. One of my favorite track traditions that we do as girls distance is having Friday Fun-days. Usually on Fridays, after going on our workout run, we will go to a park and play Ultimate Frisbee for a while before finishing practice. It is a great way to bond as a team, and, being the competitor that I am, I normally get a harder workout from the game than our run. In high jump, I love competing against all the other elite jumpers. After competing together at several important meets, huddling together under blankets in the cold at the Hamline Elite Meet, and sharing the few umbrella tents that weren't blowing over at the State Meet, I feel like we are all friends when we compete. Encouraging each other and cheering the others on creates an atmosphere that fuels both my individual performance through the challenge of those competing and genuine excitement and happiness for the success of those around me. Julia Fixsen, in particular, has been an inspiration and great competitor for me. She is an incredible athlete in both the pole vault and high jump, and she never fails to give glory to God for her successes. My parents have been incredibly helpful in my athletic career in providing me with the means to all the opportunities I have had as an athlete and in inspiring me to have the work ethic and passion for everything I apply myself to. My mom devoted untold hours in coaching me in track, volleyball, and basketball for many years and throughout middle school. I am incredibly grateful for everything my parents have done for me and all the sacrifices they have made. They raised me to be the person I am, showed me what hard work truly means, and taught me how to find my self worth - without them I would never have come close to what I have accomplished. At competitions, my family is amazing in supporting me along with my friends and teammates. At the State Meet, my parents, brother, sister, grandma, several teammates, and some of my coaches from other sports were all there cheering me on. I am so grateful to have such a strong support system and to have all of these people in my life. My freshman year of track I had to overcome some physical challenges involving ankle injuries. I sprained both of my ankles fairly early into the season and rolled both multiple times after this. For over a month I had to elevate and ice my ankles while doing homework every day after track practice. Although I continued to compete in all of my events, it was mentally exhaustive to keep repeating the same injuries. The weekend before the State Meet I re-sprained my right ankle while playing badminton with my brother. I was lucky and thankful that it wasn't my takeoff foot, but it still made it painful to run and I struggled with my confidence in jumping. However, I still placed seventh in the meet and I was incredibly thankful to do so. After the State Meet, I continued to have ankle problems during my summer training programs for basketball, volleyball and soccer as well as into my volleyball and basketball season. I rolled my ankles multiple times during volleyball when blocking, as well as while hiking on the Northshore. Eventually though, through regular ankle strengthening exercises and attentive care, my ankle problems disappeared and I finished the season without sustaining any serious injuries. Overcoming this ongoing challenge taught me how to keep fighting through incredible frustrations and how to make the best out of situations even when everything isn't as I would have it. As with any season, my main goals are to continue improving. For my main events, the goals I have set for myself are 5'11" in high jump and 2:14 in the 800 M. I am not afraid to set my goals high, but at the same time I believe that exceeding these goals is not at all outside my realm of possibility. 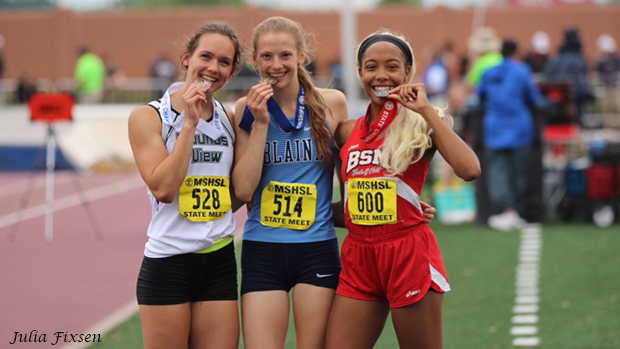 I also intend to compete in the long jump and hurdles for some meets this season because I am interested in being a multi-event athlete in the pentathlon or heptathlon in college. Have you started looking ahead to potential post-high school opportunities? I have definitely started looking ahead to college for both athletics and academics. I want to pursue both track and my education at the highest level possible. Athletically, I see myself improving greatly in the next two years and continuing to do so in college. Being a multi-event athlete calls to me especially because it allows me to continue my passion for both high jump and mid-distance running as well as gives me room to explore and develop my potential in other events. Academically, I am interested in Biochemical science or engineering and I intend to pursue a masters degree after completing my undergrad. I don't have many rituals surrounding how I compete, as I am not a superstitious person by nature, but one of my favorite traditions as the State Meet approaches is that our coaches take all of the girls that qualify for the State Meet out for dinner at Olive Garden. This is by far my favorite restaurant, and conquering as many of their salad bowls as socially acceptable certainly puts me in the mood to scale the podium at the State Meet. This year, my teammates and I are looking forward to getting back on the track and setting new PRs. A specific goal we have as a team is making it to True Team State. 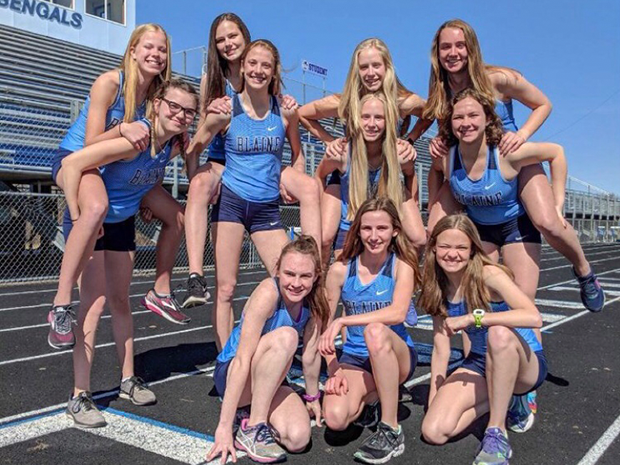 Our coaches usually fill the locker room white boards with things like '#wanttobethebride' before the meet, and the whole team is really motivated in pushing each other to get there. When I am not doing anything track-related, chances are I am in another sport, but when I do have free time I love being outside, hiking, fishing, swimming, reading, painting, drawing, swing dancing, or playing the ukulele which I am in the process of learning. I also love spending time with my friends, a few of whom I have known since I was three years old and are essentially sisters to me. Traveling is another one of my passions - I love learning about other cultures and seeing all of the beautiful places God created. The advice I would give to younger athletes is to never underestimate themselves and to come everyday to practice and meets ready to push themselves past what they think they are capable of. Hard work will always pay off, even if it is not in the way you envision it. Do you have any specific jumping advice or tips that you would like to share? The best advice I can give is that after everything technical, from lean to angle of attack and finishing over the bar, you just have to let yourself jump naturally and jump for your love of the feeling itself. I love to write free verse poetry.